Mix it up with your Drum Circle or Class Group! 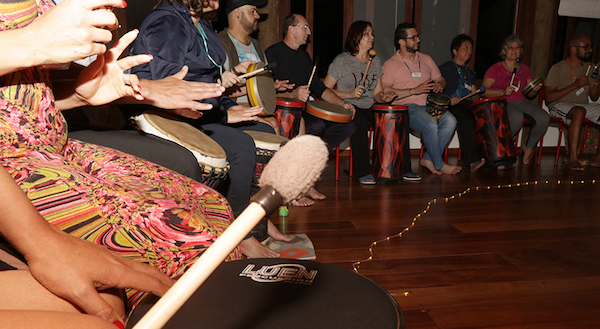 Do you lead drum classes or host a regular drum circle? How about offering them something different? Build their playing skills and confidence? I use rhythm exercises, movement, guided imagery, time signature exploration, reflection and discussion and more. (I'll collaborate with you to choose specifics.) And of course, there will be plenty of deep, juicy grooves! As drum circle drummers know, the magic moment in group drumming is when the music blossoms into Something Bigger that transcends the sum-of-the-individuals involved. When creativity and connection flow. When the Music plays us. Pulse of Positive is a new way to get to that musical place. It's a multi-stage rhythmic journey that starts simple and relaxing, and leads to juicy improvisational drum circle grooves. Along the way, we’ll breathe, appreciate, and fully let in rhythm’s healing power. We’ll bring out simple rhythm principles that help make good music — and apply in daily life, too. Most of all, we’ll co-create the community spirit from which great grooves can flow. Everyone gets what they need in the Pulse of Positive experience. Beginners learn fundamentals that help them support the groove. Experienced drummers delve further into rhythmic expression, re-appreciating why they got into this in the first place. In fact, this the perfect place to bring the “rhythmically curious,” or rhythmically curious friends. 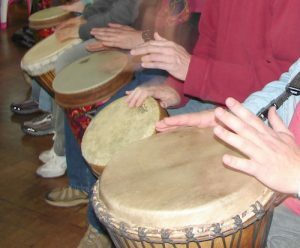 In a drum circle or ensemble, the low-pitched bass drum creates the backbone of the rhythm — the sonic pattern that other players orient to. Learn the secrets of juicy, melodic bass lines that are fun to play, and add depth and interest to the music. Though the techniques are pretty simple, it takes a special orientation and sensibility to bring out the full potential of playing the bass! Read more about my "philosophy of the Bass." In drumming and in life, a good sense of rhythmic structure tells you where you are in space and time. This gives a strong platform to try new things, and helps you "fall back in" when you're out of sync. 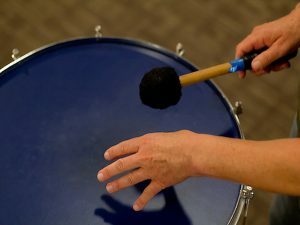 In these workshops, we explore basic underlying rhythmic structures using movement, percussion, and song. Selected to support your group's repertoire, we explore archetypal patterns for clave and bell, polyrhythms, and different time signatures. 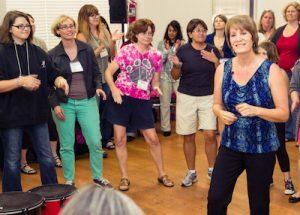 As participants build their kinesthetic sense and cognitive understanding, they'll understand the songs you're working on at a deeper level. Interested? Tell me about your group and the possibilities! Join my mailing list to receive the Rhythms of Influence ebook, and occasional news and updates about my work and travels. © 2019 Mary Tolena. All Rights Reserved.